Want More Accurate Data In Your Sales Reports? When setting about combing through your team’s sales reports, have you ever wondered why the data you’ve been given is always incomplete or out of date? You know they logged a given number of visits but were they follow-ups? Or perhaps it was a new business call? Did they discuss a potential product upsell or cross-sell during the visit? An extension to their current contract? Or perhaps the meeting went south, with a client objection being handled poorly by one of your field sales team. The thing is, without the granularity provided by efficient data entry you just don’t know. You don’t have the visibility needed to make the tactical decisions required of a good sales manager. So why is it you lack real-time sales data? In the case of field sales teams it nearly always stems from the data entry process. Field reps are given slow, cumbersome CRM tools with which to record their sales visit information. They are extremely difficult to use (especially from a mobile device) meaning frustration begins to take hold causing them to abandon the CRM. 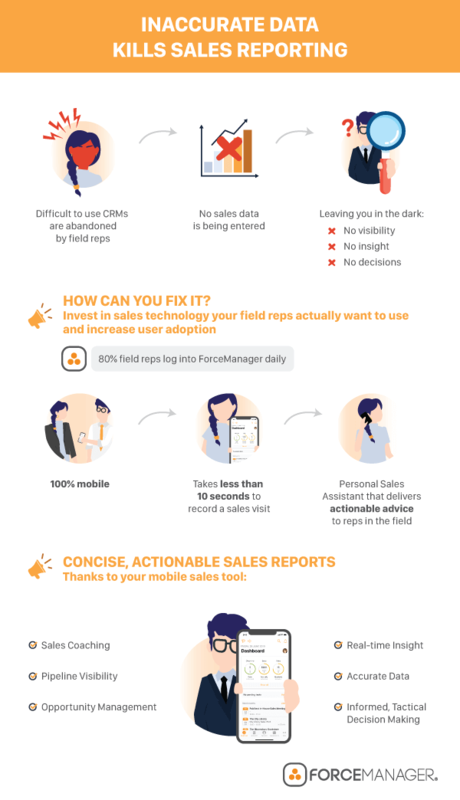 As you can see from the infographic, fixing your data entry problem begins and ends with the digital transformation and mobilization of your field sales team. Not only do you need to employ a mobile sales tool, but it needs to be one your field team are going to use. If they use it, and do so regularly, you’ll start to see a steady stream of real-time data being flowing into your CRM. This real-time data can then be used to make concise, actionable sales reports that pinpoint irregularities in your sales process, weak areas in your strategy and inefficiencies in your team’s performance. Start making solid, data-backed decisions to increase your sales performance and forecasting accuracy now with the market leading field sales application.